Finding a night diapering solution seems to be a pretty common dilemma, and I always read and respond to questions about it. I repeatedly heard people talk about DypesByDixon Sweet Slumber pocket diapers. Since one size pocket diapers are my diaper of choice, I was intrigued. Especially since they are fleece. My son is not sensitive to PUL (knock wood!!) but I’ve heard of children developing a sensitivity, so I’m always interested in non-PUL options. The diaper maker stocks in her own Hyena Cart store, as well as the Whimsical Fluff Congo and the Cuties With Cloth Booties Congo. Her diapers are pretty popular and sell out quickly, but I contacted her and she agreed to make me a custom! I was really pleased with the charcoal fleece/black snap combo I chose, and the diaper came really quickly. I think it’s a nice touch when diapers are packaged professionally. I know the packaging has nothing to do with the diaper, but to me, the maker taking care to package it like this shows me they probably took the same care when making the diaper. I always appreciate care instructions. I don’t like having to hunt them down, and not every diaper has the same instructions. 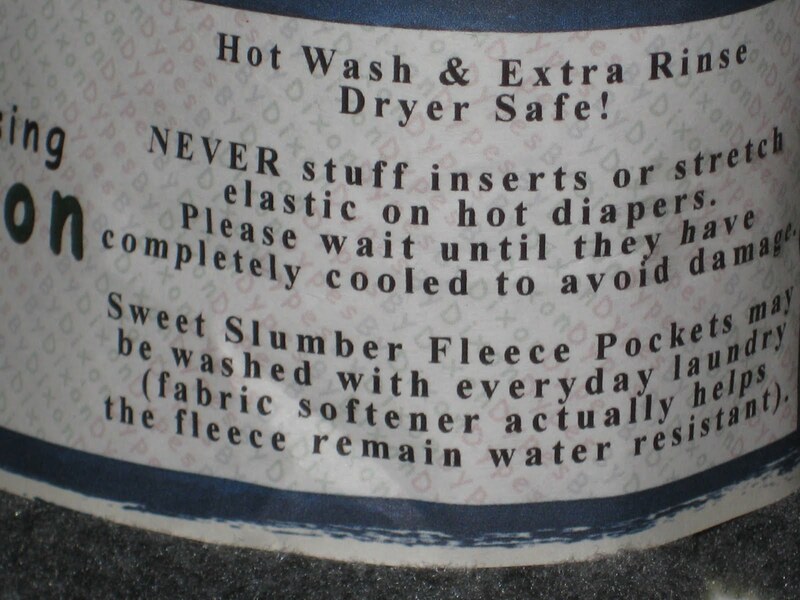 I never thought about waiting until the diapers had cooled before stuffing them, but it makes sense. The sleeve also had weight guidelines. There are 4 size settings, similar to the Happy Heiny’s, they seem to be about a small, medium, large and extra-large/toddler. My 16ish pound son fits well into the medium. I definitely think this diaper will fit for a long time! In the interest of full disclosure, when I scrutinized the diaper, I did notice that the snaps are not perfectly straight. They’re not totally out of whack and don’t affect the function or closure of the diaper in any way at all, and I am not saying this as a dig at the maker. Just that they don’t look as though they were factory applied like a mass produced diaper. The snaps only look weird in this picture because it’s not completely flat. You have to look pretty closely to see that the snaps aren’t in line like little snap soldiers. I don’t know if anyone else has ever watched How It’s Made, but I’ve been surprised by how much is done by hand. For example, in an episode about rain boots, a seamstress sewed the same part of the boot over and over, and over again. She did it so quickly, it was practically in the blink of an eye. I would have guessed that was done by a machine. That said, she sews the same part day in and day out, hundreds of times. What she did so precisely in just seconds, would take even an experienced seamstress several minutes to accomplish. In any case, this digression was just to say that I’m not picking on the maker since she has probably applied snaps hundreds of times, ever, not per day. I think the longer a diaper maker has been in business, the more precise she becomes. The inside is super soft suede cloth. 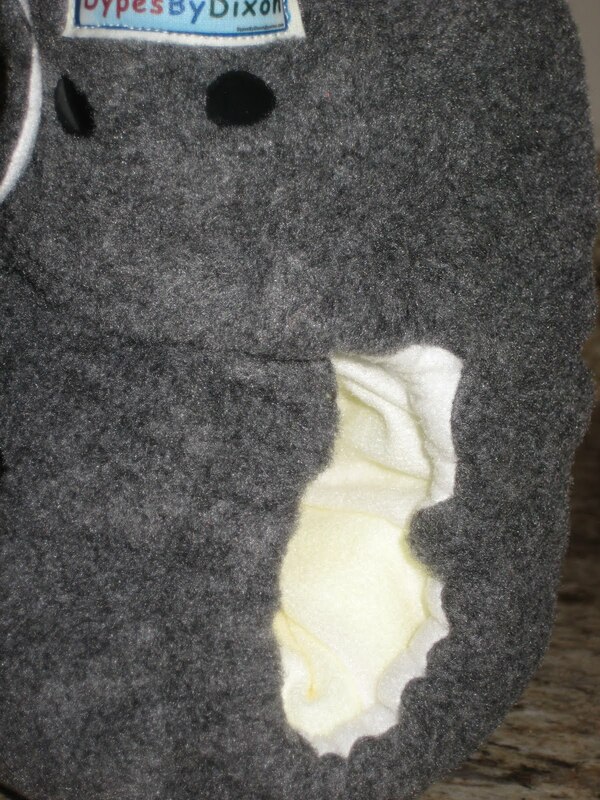 One thing I love about pocket diapers is their stay dry inner. This one is particularly soft! DypesByDixon come with a microfiber towel to use as an insert. I chose to pay an extra $1.50 for an additional towel. Even with that, I think this diaper was an absolute bargain at $19.50 shipped. Ideally, I prefer to buy a diaper that comes with a sewn insert. Not only so I can use the diaper without making an additional purchase, but because the insert is usually sized just right to fit in the diaper, and has usually been tested for function in the diaper as well. However, I’m glad it came with something! We got a great fit! The two microfiber towels got us through the whole night with no leaks, but they did add a bit of extra bulk between the legs. It didn’t cause any problem at night, but I did end up with a leg gap while I was holding him on my hip before bed one night, leading to a wet Mommy! I also don’t love having to fold them (the feeling on my hands bugs me for some reason); I could probably get a trimmer fit if I folded them differently, but I also had to make sure the end wasn’t too close to the top of the pocket. If the inserts sticks out, you can end up with wicking. Since then, I’ve tried the diaper with a superdo insert, two microfiber inserts + a hemp doubler, and a loopydo insert + microfiber insert + hemp doubler. All got us through the night with no leaks! 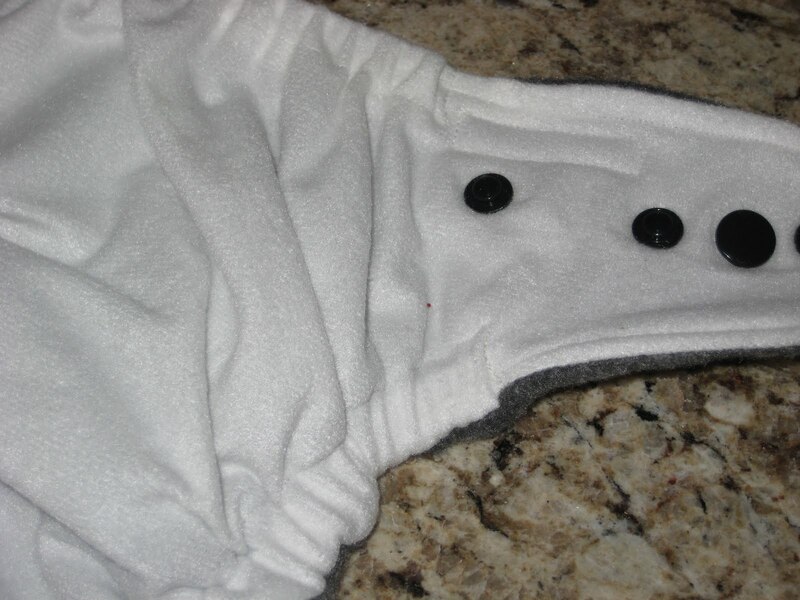 DypesByDixon minky pocket diapers are also very popular. Right now you can win one for the cost of shipping ($3.50). You have to have an account on Hyena Cart to enter. Become a fan of DypesByDixon on Facebook, then enter the giveaway on Hyena Cart. Do it quickly, the Drawing ends April 1, 2010, 12:00 pm EDT. All in all, this is a great diaper and a great value. The 4 sizes along with the ability to overlap the snaps means that the diaper will fit a huge range of sizes and last a long time! Edit August 2010: This is still in our regular night-time rotation, stuffed with a Knickernappies Superdo!